Rajinikanth Film Review From Andha Kanoon. Andha Kanoon Movie. 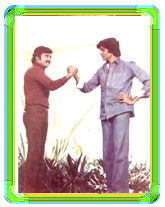 Rajini Film Andha Kanoon. Rajinikanth Andha Kanoon movie. www.rajinikanth.com. Jan Nissar Akhtar Khan works as a Forest Officer, and lives with his wife Zakhiya. One day while on duty he comes across some poachers who were cutting sandal wood trees illegally. When challenged, they retaliate, a struggle ensues, and one of them, Ram Gupta, gets killed. Khan is charged with killing him, tried in Court, and sentenced to several years in prison. His shocked and devastated wife kills herself. Years later, an angry and embittered Khan is released from prison. One day he comes across another young man, Vijay Singh, and finds out that he is struggling with taking vengeance against two men who had traumatized and killed some of his family members, and decides to help him. It is then Khan finds out that Gupta is still alive and decides to kill him, quite dramatically in the same courtroom where he was convicted for his murder. Watch how this action will effect Khan's future, and Vijay's plan for avenging his family.